The right fly depends on a variety of factors, including time of year, day and location. What flies are working? This is the question that you hear most on the stream, talking to other anglers and definitely in every fly shop. The answer is not an easy one, as it changes month to month, day to day and sometimes hour to hour. Flies change from river to streams and lakes to creeks. 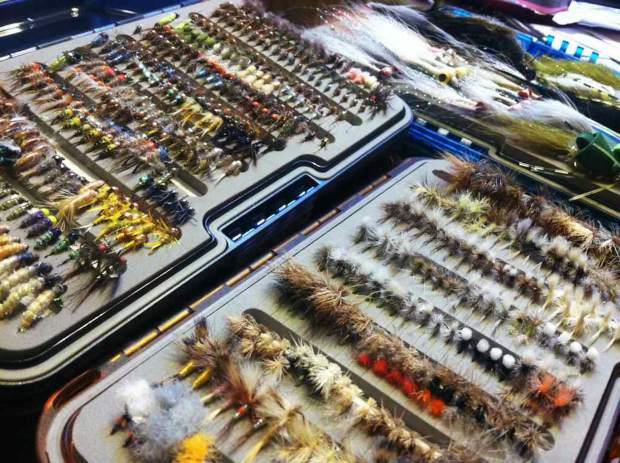 The selection of your flies can make or break your day. These next flies will help you in most situations that you might encounter this summer on the river. This fly is a crusher for any trout that is keyed in on caddis sub-surface. This is a variation of the classic hare’s ear nymph. What makes this fly so deadly, besides its classic design, is that it has soft hackle wrapped right behind it’s beadhead. This soft hackle gives this fly more action and it also traps air to give it the look of an emerging adult. The rainbow warrior is one of the best dropper flies to utilize in dry dropper rig (dry fly with a subsurface fly hung behind it). It’s tied with a tungsten bead which makes it sink fast and gets in the zone quickly. It doesn’t replicate anything specific but works wonders for midge larva and pupa that are almost always present in the water. The RS2 is a fly that every angler in Colorado or the West should have in their fly box. No questions asked. This fly can be used as a dry, a fly in the film, or a dropper. It’s a very simple fly that imitates an emerging baetis. If your having a tough day fishing, then tie on an RS2 and in most cases, it’ll turn the day around. The first time I saw one of these flies, I scoffed at it. It is an ugly fly. It’s earned its nickname “Cat Poop” because it looked like a small cat turd with rubberlegs. However, tie it on your line when the stoneflies are present and it will quickly earn your respect as it did mine. This is a great lead fly in the two fly nymph rig because it’s wrapped in lead under its ugly fasade. One of the most iconic and classic dry flies in the game. The Eagle River is a fantastic caddis fly river in the early summer. Waves of caddisflies can be found most afternoons and evenings — enticing dramatic, splashy rises. The elk hair caddis is an amazing imitation of the natural adult. It’s easy to see, floats likes a cork, and has fooled countless trout. It started with the adams dry fly, then it developed into the parachute adams by putting an easy to see post and horizontal hackle around it. It then evolved to a near perfect imitation of a mayfly with the addition of an extended body. This is my go to pattern for anytime that trout are rising to blue winged olive mayflies. Some of the most wary fish in the tailwaters of Colorado have fallen victim to this fly. Parachute Madam X is one of the very favorite general attractor dry fly because it is a high floating, easy to see bug. It can be fished in fast water and imitates stoneflies or caddis flies. It also is an amazing fly to drop nymphs behind due to its ability to float extremely well. This fly can be dead drifted through riffles or twitched to trigger sudden strikes. One of my all time favorite streamers. This quick sinking articulated trout slayer is tied in variety of colors; black, natural, and white are my favorite. This fly is a great sculpin imitation that can be used on small creeks to large rivers. It’s incredibly dangerous in a double streamer rig as the second fly behind a flashy attractor streamer. Yes, trout eat mice. Mouse fishing can be one of the best times you can have with a fly rod in your hands. The anticipation and excitement can be addicting. The best time to mouse fish is dusk to dark and it can be a lot of trial and error to see what works best. Casting blindly into the dark can be frustrating at times however that frustration can quickly evaporate when the sudden burst of noise breaks the silence of a cool summer night. This is the essence of mousing. If you have a friend that loves to tie flies and offers you a couple to try out, then take them. Sometimes the best fly to use is a fly that you’ll never find in a fly shop. When I tie a new pattern, I usually hand out a couple to friends for a test run. Whether it’s a little simple midge, a flashy nymph, or a complex streamer that doesn’t have a name, it’s usually something the fish have never seen and might be the game changer. When it comes to fly selection, if you have a box stocked with the flies mentioned above, then you will be one step ahead of the curve. Take some time and read about what flies are present in the waters you are fishing. A combination of that knowledge and these flies should be a recipe for success for even the novice angler. Get out there and fish. Ray Kyle is the shop supervisor, customer service lead and a guide at Vail Valley Anglers. He can be reached at 970-926-0900 or rkyle@vailvalleyanglers.com.